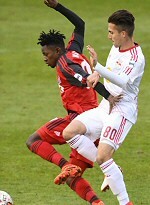 New York Red Bulls II and Toronto FC II played in frigid conditions at BMO Field Saturday night, ending in a 0-0 draw. The draw extended NYRB II's unbeaten streak to five matches. Red Bulls Academy product Chris Lema made his first career USL pro start going the full 90. New York's best chance of the first half came in the 38th minute in what looked to be the opening goal of the match from Amando Moreno, but the referee ruled a handball and issued him a yellow. Evan Louro went virtually untested, making three saves and recording his second clean sheet of the season. In the 60th minute, Moreno was taken down in the penalty area and awarded a penalty kick. Stefano Bonomo's attempt would be saved by TFC II goalkeeper Caleb Patterson-Sewell.